O.D.M. 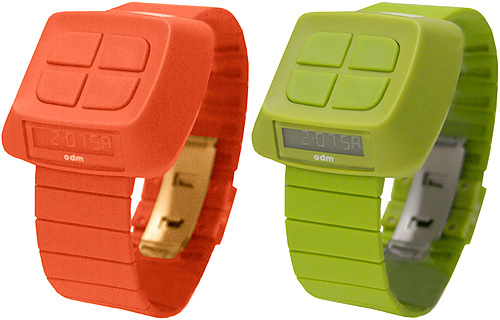 Reorganizes The Traditional Digital Watch | OhGizmo! So it turns out that swapping the location of the buttons and the LCD display on a digital watch, just like O.D.M. (Original, Dynamic and Minimalist) has done with their Reverse Double Digital design, radically improves its functionality. Placing the programming and mode buttons on top, where there’s considerably more real estate, allows them to be larger and easier to press. And the angled time display, which has been moved to the top and bottom of the case’s sides, are easier to read from any angle without having to turn your wrist as much. The RDD watches also feature a matte plastic finish, making them water-resistant, and are available in your choice of black, red, green or white for $120 from Watchismo. Okay, this is a cool idea. Buttons on top, where there's more room; time on the side, where it's easier to read. But I have an issue with the aesthetics– I don't see a whole slew of people dying to don one of of these bright green or bright orange monstrosities with their business suit. Maybe they can come up with the same concept, but with a little more attention to style…. They really don't look great. I don't like watches much, especially ones that are plastic and cheap looking. Is it only my opinion or the 120 price tag is kind of….steep?